Vinyasa Yoga, a contemporary style that has evolved from the traditional Hatha, refers to a form of yoga that follows a particular series of asanas (postures). The Vinyasa Flow yoga comes from the Yoga Sutras of Patanjali is the basic text of all styles of yoga. The word Vinyasa means a sequence that is synchronized with breathing body movement. The teacher shows how to move from one position to another in an inhalation or exhalation. In modern times, the Hindu Yoga teacher Sri Krishnamacharya began the mass dissemination of this dynamic form of yoga. These positions are designed in order to create a specific pattern or a smooth flow. Therefore, Vinyasa Yoga is also known as Flow Yoga. In Vinyasa Yoga, all positions held by the body are connected through rhythmic breathing, so a dynamic strength and energy is created in the body. This form of yoga is more effective if the correct breathing techniques are used and deep breathing can have a very soothing effect on most people. 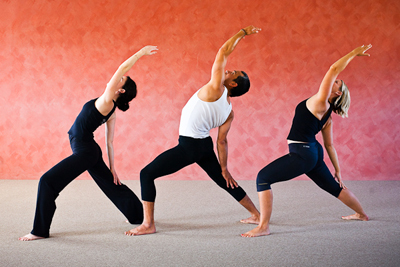 Flow (Vinyasa) Yoga has become increasingly popular in the West. Most rehabilitation centers, trauma treatment facilities and eating disorders (overeating, anorexia and bulimia) residential programs that include in their treatment methods. But the most important thing is that through practicing Vinyasa Yoga we entered another level of consciousness, which is more spiritual, peaceful and healthy. Start with the Tadasana (The Mountain Pose), which is the basic standing position. Exhale and turn your left leg so that the heel touches the yoga mat. Enter Utthita Parsvakonasana (Extended Side Angle Pose). Exhale while moving in Trikanasana (Triangle Pose). Continue to hold this position while you inhale. Exhale and turn inward, while stretching the right leg. Inhale while bending in Utthita Ashwa Sanchalanasana (Lunge Pose).